Schools and education are changing with the new generations. The New generation parents are paying good deal of money for the education of their kids, a school teacher seem trying to do best on developing the teaching as a hobby amateur entertainment so educationalist are nowadays developing sophisticated infrastructure for the schools as social welfare and businesses and businessmen are donating to schools one or other way. So far everybody is interested as well doing something better then they has been doing so we ourselves cannot bear from going on to this scope? 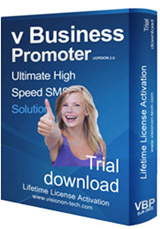 v Business Promoter for Schools is a collection of software & services for the sending and receiving of SMS Text Messages within educational establishments. Implementing a v Business Promoter for Schools is very easy as we provide you with all the software you need to get started. We developed Software for the users that are most acquainted with MS Excel. HOW CAN YOUR V BUSINESS PROMOTER FOR SCHOOLS HELP US? We listed common activities to send messages to parents/ teachers / trustees as the following ways. Reduce the cost by sending SMS instead of making calls or on stationary. Schools can send fees collection SMSs using v Business Promoter for Schools. Schools can send fees collection reminders SMSs using v Business Promoter for Schools. Schools can send school / parent relationship messages in regular interval using v Business Promoter for Schools. Schools can send Teacher / Parent relationship messages using v Business Promoter for Schools. It’s easy to send season’s greetings messages using v Business Promoter for Schools. Schools can staff notification messages using v Business Promoter for Schools. Schools can send Trustees meeting notification messages using v Business Promoter for Schools. Schools activity alert messages can be sent using v Business Promoter for Schools. Eid Vacation / holiday notice messages can be sent using v Business Promoter for Schools. school and parents both drop and pickup child. Annual day notification messages can be sent using v Business Promoter for Schools. Summer vacation notice messages can be sent using v Business Promoter for Schools. Convocation / Result day notification messages can be sent using v Business Promoter for Schools. School Opening SMSs can be sent using v Business Promoter for Schools. Schools achievement SMSs can be sent using v Business Promoter for Schools. Admission opening messages can be sent using v Business Promoter for Schools. Admission confirmation messages to parents can be sent using v Business Promoter for Schools. 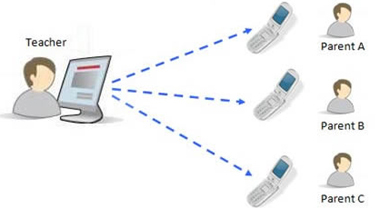 You can also receive the messages on school computer that are sent on specific number using GSM/GPRS Modem, Mobile Phone. Free up your valuable time and the time of admin staff when contacting parents or responding to repetitive requests. Dramatically reduce time taken to contact supply staff and arrange cover when staff call in sick. Impress the OFSTEAD inspector at his next visit…maybe. Please write us on info@visionon-tech.comIf you have suggestions that schools can also be helped with some other type of messages or in your school you have own requirement.